Khoa a diary product widely used in India is made of either whole milk or milk thickened by heating in an open iron pan. The fatty acid composition of Khoa, a heat-desiccated milk product is determined and compared to those obtained from cow milk, buffalo milk and toned milk. Khoa is normally and frequently adulterated with wheat and rice flour. 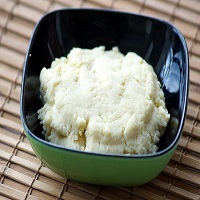 Starch is mainly used to adulterate khoa. To detect adulteration one can boil a small quantity of khoa with some water, cool it and add a few drops of Iodine solution. Formation of blue colour indicates the presence of starch.